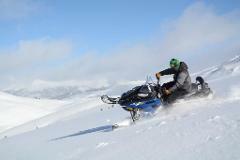 WHITE MOUNTAIN SNOWMOBILE TOURS, GUIDED FAMILY PROSPECTOR SNOWMOBILE ADVENTURE. WHITE MOUNTAIN TWO-HOUR PROSPECTOR FAMILY SNOWMOBILE TOUR, Guide Gratuities are not included in the tour price. The Prospector Tour is for beginners, families with children and adults who want to ride together on the same snowmobile. The riding area is around Turquoise Lake with 14,000' mountains being the beautiful scenic backdrop. County roads in the vicinity are closed to vehicles in the winter so this tour provides miles of smooth riding on groomed trails as well as playing in endless snowy meadows. Parents will appreciate a brief stop so children up to 70 pounds can take a turn driving a kiddie snowmobile while other guests enjoy free-time riding. Single Riders are $125, Passengers 7 and up are $65.00, Children 4, 5, and 6 are $30.00 with adult driver. Adults cannot ride with a Guide..
All riders must sign a standard liability waiver before touring. TOUR TIMES ARE 9:00, 12:00 AND 3:00. *Arrivals for all tours is 30 minutes prior to tour time. *Pregnant women may not snowmobile. *Children under 4 may not snowmobile. From Copper Mountain Exit 195, go south on Highway 91 for 14 miles. Look for mile marker 7 on the left, slow down, see our blue signs on the right side of 91, turn left into our driveway well marked with colorful flags. Notice the 100' tower in the parking lot, it is very visible when proceeding south. Meet your guides and check in at the red two-story building. Wear warm winter clothing. complimentary coveralls and boots are available if needed. Be sure to bring gloves and goggles. Helmets are provided. Ski Helmets are not appropriate for snowmobiling. Look for White Mountain Snowmobile Tours on Trip Advisor. Certificate of Excellence Winner. 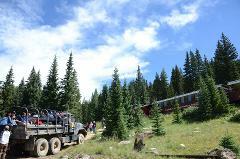 The Standard Two-Hour PROSPECTOR ZIP LINE TOUR. Does not include guide gratuity. WHITE MOUNTAIN, TWO-HOUR PERFORMANCE SNOWMOBILE TOUR, Guide Gratuity is not included in the Tour Price. 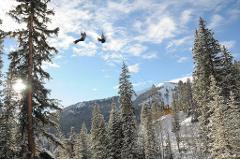 TOP OF THE ROCKIES - WINTER SNOWCAT/ZIP LINE TOUR, Guide Gratuities are Not Included in the Tour Price. WHITE MOUNTAIN TWO-HOUR HIGH ADVENTURE SNOWMOBILE TOUR, Guide Gratuity of $40 is not included in the tour price. 5-HOUR THRILL SEEKERS COMBO - PERFORMANCE SNOWMOBILING PLUS ZIP LINING WITH LUNCH. Guide Gratuities are not included. 5-HOUR THRILL SEEKERS COMBO - PROSPECTOR (FAMILY) SNOWMOBILING PLUS ZIP LINING WITH LUNCH. Guide Gratuities are not included in tour price. 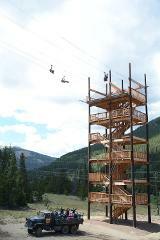 2-HOUR, TOP OF THE ROCKIES ZIP LINE TOUR PLUS LUNCH. SEE OLD GOLD MINING AREAS SURROUNDED BY THE HIGHEST MOUNTAINS IN NORTH AMERICA. Available May 25 to October 15th, Gratuities not included.